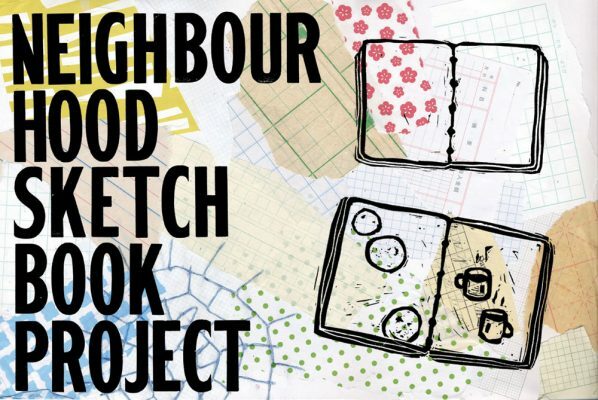 Neighbourhood Sketchbook Project features hand-bound and art-filled sketchbooks from members of ten Downtown Eastside organizations. Each sketchbook tells a story of the person who created it—the pages resonating with the joy, wisdom, and resilience of these artists and of their community. The sketchbook is a medium that features the process of art-making while also becoming an art piece in and of itself. Experimental, freeing, and eclectic, this process makes way for the artist to take risks and to grow their creativity. Much like a sketchbook, the Neighbourhood Sketchbook Project is a collective experiment. In an effort to honour the strength and vision of communities that comprise the Downtown Eastside, it also takes risks and remains open to possibilities. The project builds upon the tireless work of neighbours, workers, groups, and organizations who strive to build relationships and trust with the participating artists. Multiple considerations of access, support, and translation were mounted in order to meet community needs. This groundwork allowed us to bring something new to those for whom the neighbourhood is vital. The work on display is the culmination of a series of workshops, where artists of the Downtown Eastside gathered to learn and experiment with various art-making techniques, guided by WePress artist facilitators. Artists lovingly composed content and artwork using block and letterpress printing, drawing, collage, Chinese brush painting, hand quilting and embroidery as well as their own innovations. At the opening reception, visitors are invited to fashion their own sketchbooks as they draw inspiration from the featured collection to start a storytelling journey. This project is a collaboration of WePress, Gallery Gachet, and the Powell Street Festival Society, with participating organizations: Aboriginal Front Door, Carnegie Community Centre, Chinatown Concern Group, Culture Saves Lives and Spirit Sisters Prevention Response Team (SPRT), DTES SRO Collaborative and the Tenant Overdose Response Organizers (TORO) program, the Downtown Eastside Women’s Centre, Oppenheimer Park, and Youth for Chinese Seniors. We thank the Vancouver Foundation, Canada Council for the Arts, City of Vancouver, Province of British Columbia, BC Arts Council, BC Housing, the Community Arts Council of Vancouver, and Skookum Catering for their generous support of this project.